On Nov 22, 1967 Promoter Ed Francis presented a professional wrestling card at the Honolulu Civic Auditorium featuring a six man tag team match and three other events. In the opening event Billy White Wolf and Dutch Schultz battled to a draw. In the next match of the evening The Alaskan defeated Frankie Allman. 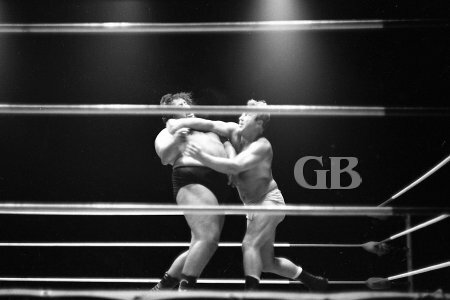 The semi main event saw Curtis Iaukea and Nick Bockwinkel battle to a draw when time ran out after each wrestler had won a fall. Nick Bockwinkel lands a solid elbow on Curtis Iaukea. Bockwinkel stuggles to keep his Abdominal Stretch on the massive Iaukea. Billy White Wolf Tomahawk Chops Kenji Shibuya as Angelo Poffo watches from the corner. Angelo Poffo holds onto White Wolf's leg as he readys to tag Shibuya. Jim Hady cranks up the pressure with his arm bar on Poffo. In the main event of the night, the trio of Billy white Wolf, Jim Hady and Johnny Barend defeated Kenji Shibuya, Killer Kowaliski, and Angelo Poffo. Killer Kowalski threaten's referee Pete Peterson as Kenji Shibuy and Angelo Poffo argue in the background. Jim Hady sucker punches Kowalski as the Killer stands outside the ring. White Wolf about to double Tomahawk Chop Kowalski. Johnny Barend applies a painful Arm Bar on Poffo, who tries to break the hold by pulling on Barend's hair. White Wolf comes to the aid of Hady by giving Kowalski the boot. Jim Hady lands a perfect Drop Kick on Kenji Shibuya.